Gaza Strip this tiny peace of land with a window to the Mediterranean sea has always news for the world, some hear the name Gaza and expect to hear bad news all the time but this time is not Israel bombs making the news, but Omar Karem a young Gasawan that presents his first photographic exhibition to the world. Gaza a land of close to 2 millions Palestinians life moves fast and the dreams of the youth are not different from others, they want to travel the world and take their art outside of Gaza Walls. Since 2005 that Israel decided to confined Gaza to its borders photographers and other artists are force to make their trade using the internet as the only window to the outside world. They need to find ways to give us their art, using social media spaces, blogs or Independent Online Photo Exhibitors. They go to extreme lengths to pursue a career in photography,Gaza Strip where more than 50 % of the population is unemployed studying is almost a luxury, but they find the way to study with borrowed equipment and all they succeed. Gaza lies in a conservative society and is not used to the new trends in art as the big metropolitan cities, like New York, France or London, where a photographic exhibition is a big exciting experience. Gaza Siege have deprived our young photographers of equipment necessary to fulfill their dreams. In Gaza is not easy to get professional cameras, lenses, flash cards, or filters the basic photographic items that here in the US we can get very inexpensive in Gaza if they find them the prices are double because they come through the tunnels from Egypt, and they are subject to exploitation. The situation is harsh as an occupied land, and Gaza is blocked double the struggle. Omar has a dream to travel the world, he wants to be like a regular guy that chose where to live, where to go, where to study and not have to be waiting for Israel wishes to decide his future. In Gaza every young person has a dream to live, free of fear, to live without bombs, without f16’s patrolling their sky, every young person in Gaza have struggled his whole life, and have survived the Israel Occupation. It is not easy to live under occupation, the resistant movement has taken the life of thousands of Palestinians, thousands of them have cut their dreams short, the ones alive have a bleak future, without support from their parents, but some how the lucky ones live to tell the tale and the dreamers get to chose their future. 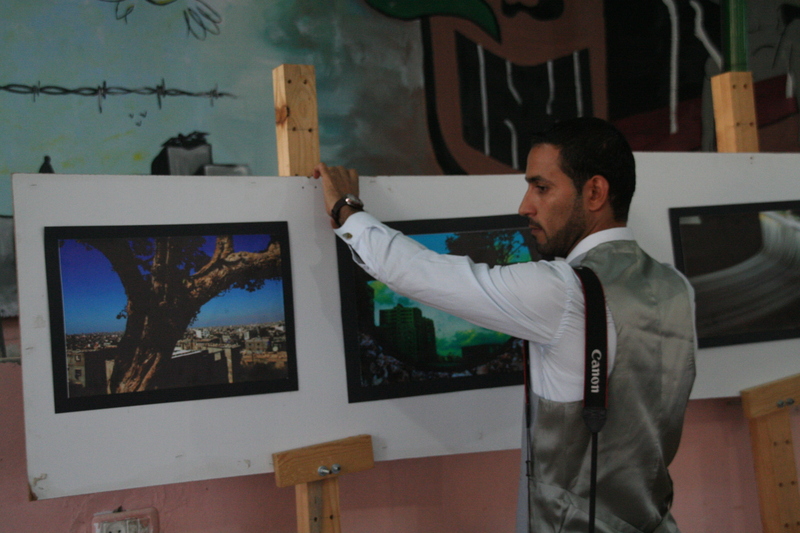 And against all odds Omar Karem managed to mounted his first photographic exhibition in Gaza. I have my hopes high that he will soon come to America to bring Gaza to us. We cross our fingers that his career takes him out of Gaza but not escaping from his land, but as an artist, as a bringer of stories for the world to know. To show us first hand that hopes and dreams never die. He wanted to bring you the other Gaza, her beautiful gardens, her beaches, to show you in prints his culture, regardless of the situation that he lives in Gaza every day with no peace under the sky, he inspired himself in his dreams to give you the beautiful side of Gaza, that part that they only know. Even with bombs from Israel after the storm they keep Gaza, they rebuild it, clean it and enjoy their piece of land, that land that is the only one they have. The best stories are printed in paper, and photographs tell a thousand words, and we will be waiting for those stories to be captured by his camera and be told.